The mid-20th century was one of the most innovative and dynamic periods of international design in history; the advent of new materials and factory production techniques, in a world eager to rebuild after a decade of war, redefined the concepts of consumer goods and led to the creation of classic product designs, many of which remain in production today. 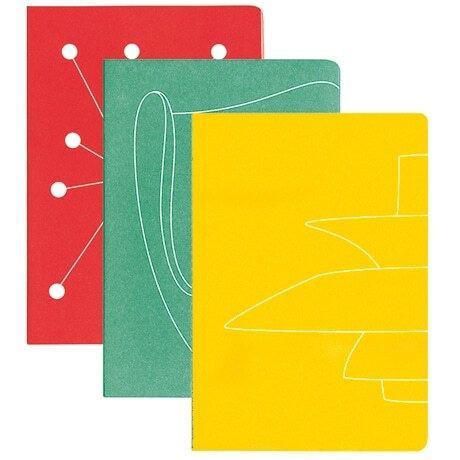 Themselves elegantly designed, these three notebooks are decorated with line drawings of iconic midcentury designs. The red journal offers narrow-ruled (5 mm) pages (with the lower quarter ruled off as a separate section on each page); the turquoise blank book has unlined pages for drawing; and the gold notebook features a faint grid of 5 mm squares. Measuring 5½ by just over 7¾ inches, the 48-page books all have colored endpapers, heavy paper covers, and stitched binding.